Have to admit to being a die hard Sierra fan, the Nosler Partition has been a standby for my Dad and Brothers for years! My Dad shot a moose in Eatern US about 20+ years ago, he said at the shot the moose just stood in place quivering before falling over dead. been a fan of the Nosler Partition since, and its not let us down if we do our part in the shot placement. I still have some 300 Win mag ammo dad loaded for the rifle he left me. I'll prolly shoot it up this summer at the range so I have the brass to load up again. Here are the results of carefull load development and the 40gr Hornay Vmax in my Bushmaster Varminter. 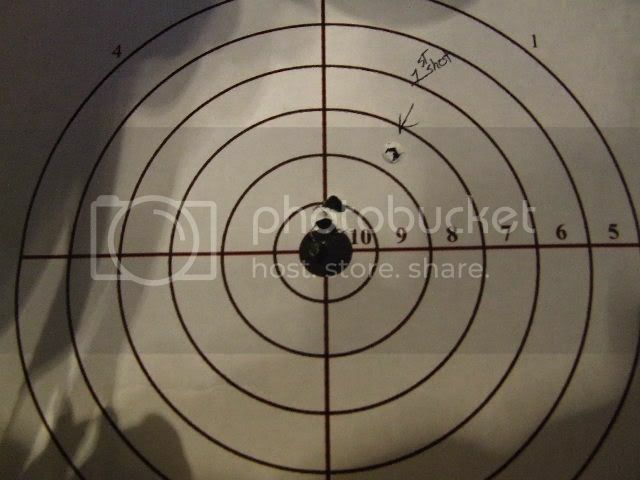 this target is a 100yd target, the center is .5" in diameter. The flyer was my fault. Yes its a 223. Its a heavy 24" nonchrome lined barrel w/ 1-9 twist. 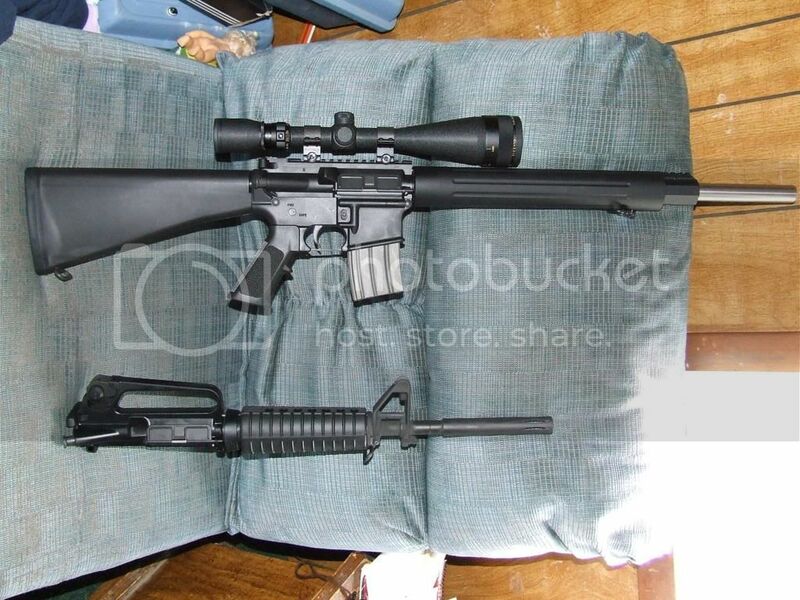 I also have a DPMS upper with a Krieger Heavy barrel with 1-12 twist that shoots as good. They both will regularly break eggs @ 200 yds. The rifle that shot the above groups. This is the rifle (on the left) that has the Krieger heavy custom made 1-12 twist barrel. The other is my 11.5 with 5.5" flash hider for FUN! I also had a .450 Bushmaster upper, but sold it in favor of the .458 SOCOM upper. better selection of .458" bullets compared to the .451" the .450" BM shot. .458 SOCOM!?! Now we're talking! I'd love to try one sometime and it can use the same bullets as my .45-70s. Hey crackshot-I've been looking at getting one of the .458 socom uppers for my "brace" of ars.-how well do they perform-really?How about brass costs?Ive got some 45-70"stuff" that would cross over nicely-but would like some 1st hand info! Great pictures! Thanks for posting. I've been debating what should be my next upper. Without a specific purpose in mind I finally gave up. .458 SOCOM was high on my list. It may be a long-barrel .223 like yours. I've had the lower for 6 months but haven't even opened it up to assemble the components. 458 SOCOM is not hard at all to load for. I use Star Line brass @ $70.00 per 100. as you know, bullets are easy to get and there is a large and diverse supply of 458" bullets out there. I load for my 1874 Sharps replica so I always have 405gr and other assorted bullets around too, It hits with athority on the few critters I have whacked with it. mostly ground hogs. Joe, good luck with the 69's, I have some 77gr Sierra's if you want to try some. 405gr ... bullets .., It hits with athority on the few critters I have whacked with it. mostly ground hogs. That's like hunting deer with a canon! What's left?!? I use Star Line brass. I got some Star Line for my .45-70 and was impressed with the quality. Case weight variation was much less for a bigger case than my Remington, Winchester, or Federal brass .270 Win and .308. I have NEVER had any bad brass from Star line!